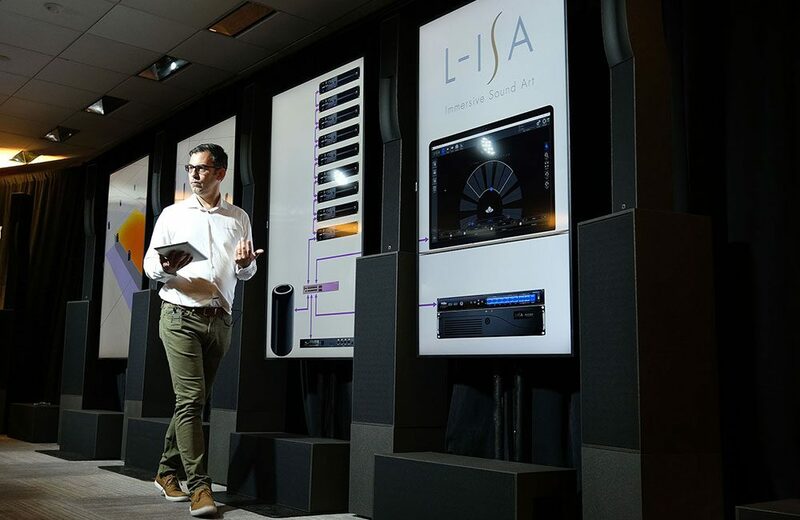 The L-Acoustics NAMM 2019 exhibit in booth 17208/demo room 203A will include a demonstration of the company’s L-ISA immersive audio product line. Scott Sugden, Product Manager, USA & Canada, L-Acoustics, conducting a demo of the L-Acoustics L-ISA system. The L-Acoustics NAMM 2019 trade event exhibit will include demonstrations of its L-ISA immersive audio products. The annual National Association of Music Merchants (NAMM) show features a range of companies that represent the professional audio industry, including musical instrument (MI) manufacturers and audio companies such as L-Acoustics. L-Acoustics says it will more than double its footprint at the event, exhibiting in booths 17208 and demo room 203A. “The combination of technology showcases, education opportunities and exciting awards ceremonies make NAMM a great place to reconnect with peers and key clients, as well as reaching the broader audience of music enthusiasts who help our industry thrive,” explains Laurent Vaissie, CEO, USA and Canada, L-Acoustics. The company’s 2019 NAMM show activities will place an emphasis on its L-ISA Immersive Hyperreal multidimensional sound technologies, but it will also show several of its other product lines. During the show L-Acoustic also plans on highlighting its interactive showroom, which it will populate with its latest speakers, processors and software. Attendees visiting the L-Acoustics exhibits, including the interactive showroom can see the company’s ARCS Wide, ARCS Focus, X Series, K Series and Syva loudspeakers. Among the processors the company will show in the interactive showroom include its new P1 AVB processor, which just started shipping a few months ago. The P1 AVB processor provides integrators options such as EQ with delay and dynamics processing, multi-microphone acoustics measurements, the ability to bridge AVB, AES/EBU and analog audio, four-bus matrix routing and time aligned redundant signal distribution.